Hamilton children with disabilities are learning to swim, thanks to a partnership between SWAM Hamilton and Special Olympics Ontario. 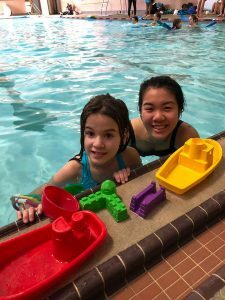 The program uses rigorously-selected student volunteers from McMaster University to give low-cost swimming and water safety lessons to children with special needs aged 2-18. Drowning is the second leading cause of death for children under the age of 10 in Canada, and the risk is increased for youth with sensory-motor or intellectual limitations. SWAM Canada is a national non-profit organization that offers affordable and accessible swimming lessons. In Hamilton, it has been providing one-on-one lessons to special-needs children for a decade at the downtown YMCA facility. Demand for the program is outpacing resources and HCF’s Ontario Endowment for Children & Youth in Recreation Fund is helping to fill the gap, with more than 100 children benefitting this year. The McMaster students who volunteer as instructors also benefit, developing leadership skills and valuable experience.